Japan has beautiful seasons, and it has been joy for celebration for many generations. It was simply a part of life, and a specific Japanese calendar“24 seasons”, or “24 solar terms” was created to indicate the subtle changes of seasons. LIFE IN SEASONS is a new event featuring the 24 solar terms calendar. We’ll be holding our events around major equinoxes of the year, featuring talks on seasonal traditions, workshops on enjoying seasonal food, savouring seasonal sake. 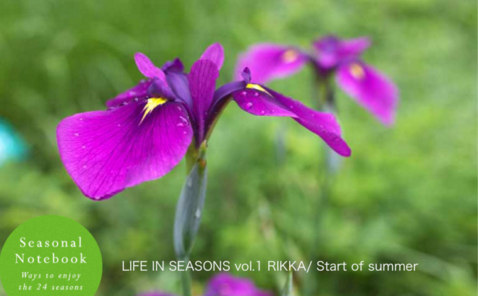 Rikka is one of 24 solar terms indicating the beginning of Summer, starting on May 5 – the date famous as “Festival of calamus/sweet flag”. Acorus calamus is a plant known as “Shobu” in Japan, and since its leaves look like samurai sword and it’s name can be also wrote down as “perfection in martial arts”, the festival was honouredby Samurais and than became a festival of boys, parents praying for them to grow up strong. We’ll celebrate the arrival of summer with workshop of making “Chimaki”- bamboo-wrapped rice cakes, enjoy seasonal tapas with sake pairing. And that’s not to mention the bilingual lecture unveiling history and traditions of “Rikka”celebration!